Financed by the Winter Olympics in Albertville, La Tania was only officially opened in 1990 but has flourished ever since. This family-friendly resort sits at the relatively low altitude of 1350m but benefits greatly from excellent links with neighbouring Meribel and Courchevel resorts as well as access to the huge Trois Vallees ski area. The majority of La Tania’s apartments and chalets are ski-in/ski-out and have been designed much more in harmony with their surroundings than the vast majority of French resorts. Accommodation of all types also tends to be much more affordable than some of the bigger-name resorts in the area which share the same ski terrain. The pretty woodland setting produces long ski runs through trees down in to the village. Although artificial snowmaking is essential at this altitude, La Tania have vastly improved their capability to do this in recent years. A gondola from one end of the village leads everyone up to the slopes, but there are rarely any long queues. Although only a small village La Tania still has all the local amenities that you could need, plus restaurants and bars playing host to live music and apres-ski drinks deals. The nightlife is mostly low-key but there are a few bars that get lively later on. Away from the mountain activities, snowmobiling, toboganning, snowshoeing and paragliding are all available to keep all members of the family happy. 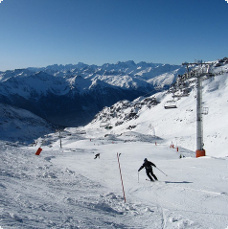 Geneva airport is the main point of entry for skiers visiting La Tania and surrounding resorts. Snowbus are proud to run a full shared transfer service between Geneva and La Tania on Saturdays and Sunday - starting from just £49pp. With a short journey time and a convenient stop in the centre of resort, regular shared transfers offer one of the cheapest methods of travel. Alternatively, private door-to-door transfers are a great way for groups to travel. Fitting in around your flights our minibus taxis allow people to spend less time waiting and more time on the slopes. 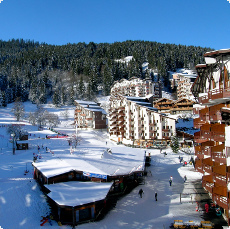 Shared transfers from Grenoble airport to La Tania are available on the Snowbus website for just £53pp. With 10 buses running on Saturdays all through the winter season we have a regular, convenient and low-cost method of travelling for individuals and small groups. Private taxi transfers are also available to and from Grenoble, and Snowbus are one of the few suppliers who use large minibuses for groups of 19 (and above). Although Chambery is a small airport, it is also the closest to La Tania and therefore offers the quickest transfer journey to resort. Private taxi transfers between Chambery airport and La Tania are some of the shortest available in this area. Snowbus operate large minibuses and coaches which provide a great option for people wanting to spend as much time as possible on skis. Lyon airport is a major travel hub for incoming and outgoing flights within this region. With a slightly longer transfer time it isn’t as popular as Geneva, but with Snowbus private transfers we can make the journey up to La Tania and surrounding resorts as quick, comfortable and cheap as possible - 7 days a week to fit in with your flights.